“I’m a little nervous,” the singer laughs. “Usually it’s just my friends here.” Sitting cross-legged on a floor cushion, in an intimate circled of similarly-seated listeners, the musician begins to play. As the first notes out of a harp-like lap instrument ring out, the smell of incense fills the terrace and the audience sits back on their cushions, absorbing the music of Zanzibar. With the Indian Ocean in the background, the crowd is enjoying the centuries old taarab music, traditional to the island. The weekly concert draws a small but loyal crowd and occasional tourists, drawn by Basalama’s voice and the exotic sound of the qanun. Taarab was originally imported from the Middle East, through the Omani sultanate’s centuries of involvement (and conquest) of Zanzibar. It evolved independently in Zanzibar, and was performed only by men until the 1920s, when a singing woman passed a famous violinist on the street just outside Stone Town, Zanzibar’s capital city. Entranced, he begged her to study taarab with him. The woman, Siti Binti Saad, became the most famous taarab singer of her generation and was the first woman in East Africa to record a commercial CD. This is the taarab that Mahsin Basalama plays. Some of the songs are ancient, others new, but all are performed in the tradition of taarab – long, lilting melodies performed by traditional instruments. Modern taarab exists as a separate genre, but its reliance on synthesized instruments makes it have little in common musically with pure taarab. Basalama is trying to bring back traditional taarab, while ensuring musicians who spend years at their craft get the recognition and compensation they deserve. The Swahili Performing Arts Centre is Basalama’s nascent NGO, just getting off the ground in Zanzibar. Basalama is Artistic Director of the NGO, whose goal is to restore and advocate for Swahili culture through music and performing arts. 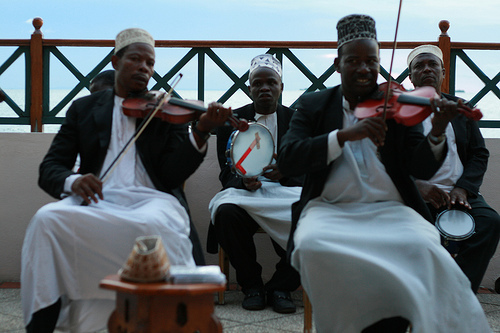 The organization is dedicated to authentic, traditional performing arts from Zanzibar and the Swahili coast region, like taarab music or traditional drumming. The Centre will be working in 2013 to create regular platforms for artists to perform their music for local audiences. Building a strong local audience, Basalama says, is key to ensuring the traditions stay alive for generations. He is also trying to keep traditional music alive in his day job, music teacher at a school in Zanzibar. “Music is my life,” he says. Through the performing arts centre and mentoring young musicians, Basalama is living his dream: keeping traditional Swahili music alive and passing it on to a new generation of Swahili artists.